Alanna was born September 18, 2000, two months early. She weighed 4 lbs 7.6 oz, with kidneys twelve times too large and under developed lungs. An hour and a half later, Alanna could no longer fight for her life. The nurses dressed Alanna and brought her back to her mother. She looked at her for one last time, a picture she will never forget. Alanna's mother was deeply touched by the gesture of Newborns in Need, an organization that provides clothing and blankets for babies who are premature or born into poverty. In such tragic times, families gain hope from seeing their babies in clothing and are comforted by knowing people care. Knitting for charity is the most rewarding form of knitting. It benefits both the knitter and the recipient. While you may not be a doctor who can give medical care to the sick, providing comfort and hope is an amazing feeling. Below is a list of charities to help you start your search. Please visit their websites for more information, guidelines, free patterns and to find a chapter near you. According to Newborns in Need, one out of every four babies in the United States is born into poverty. A large portion of the 5 million children living at or below poverty level are newborns and premature infants. Newborns in Need gives blankets, gowns, hats, booties and other items to hospitals and homeless shelters for these babies. They also provide burial clothes for babies who lose their struggle for life. Visit their website. For a similar charity in Canada, see Angel Hugs Canada. Cubs for Kids collects little sweaters, hats and scarves for teddy bears. All clothes are sent to New York where the bears are dressed and wrapped (Cubs for Kids provides the bears). Once a year, the bears are delivered to homeless shelters in various cities and given to children who are less fortunate. These bears are something the children treasure forever. Visit http://www.cubsforkids.com/ for details. A similar charity in Canada is Care & Cuddles International, and in Australia, Bears Who Care. A Stitch in Time takes its name from an old proverb that states it is best to deal with a problem before it becomes worse. This is the philosophy behind a new vocational program in Plainville, Connecticut. At-risk and disadvantaged teenagers are given the opportunity to operate an online/mail order yarn shop and retail knitting business. The teenagers learn business skills and are aided in career planning with an emphasis on further education. A Stitch in Time accepts donations in the form of money, yarn and newly knitted items. Knitted items will be sold in the shop. For more information visit their website. Project Linus gives blankets to boys and girls ages 0-19 who are seriously ill, traumatized or otherwise in need. They accept knit, crocheted, quilted and fleece blankets in all sizes. Blankets must be new (which includes being made from new materials), washable and handmade. Blankets provide security and comfort when children undergo medical treatment, a place to bury their heads and cry when they lose a loved one and familiarity when moved from one shelter to another. For more information and to find a chapter near you, visit their website. Chapters in Canada are here and for the United Kingdom go here. ChemoCaps was started in memory of Heather Spoll who, at 25, lost her life to cancer. The hats are given to cancer patients in hospital oncology units and hospice programs. These hats not only comfort the patients' heads, but also their hearts, to know someone cared enough to knit for them. ChemoCaps asks that the hats be knit in soft yarn and appealing colors. If you would like to knit a hat in memory of a loved one or simply because you want to help, visit http://www.chemocaps.com. In Canada a similar charity is Hats Off to Chemo. The mission of Warming Families is to collect blankets and other warm garments. The items are then delivered to the homeless and displaced at homeless shelters, domestic violence shelters and nursing homes. Warming Families works to strengthen families through the love and generosity of others, since strong families often have a greater determination to meet the challenges before them. Items must be new and can be either bought or handmade. Your donation can be delivered to an Area Volunteer, or you can deliver the items yourself to local shelters. For more information visit http://www.warmingfamilies.org. If you are unable to find a local chapter of the charity you want to volunteer for, consider starting your own chapter. Or contact hospitals and shelters in your area and tell them you would like to help. The two most important details to remember when knitting for charity are to take pride in your work and follow the charity's guidelines. If you would be proud to wear the item yourself or give it to a friend, then it is good enough to give to a charity. If you're too embarrassed to admit you made it, then don't donate it at all. Secondly, following the guidelines of the charity is crucial. If only new items are accepted, then don't donate your child's old blanket, no matter how gently used it is. If they ask for items to not be made in wool, then don't make something in wool. These guidelines have been created for a reason. Most charities are run by volunteers. Don't create more work for them by not following the guidelines. Also consider the colors you use for making the items. Soft or bright, fun colors for children's items -- attractive colors for adults. Finally, make sure your items are clean before donating. If you have animals or you smoke, check that they don't smell or are covered in animal hair. These smells can be fatal to newborns and preemies. 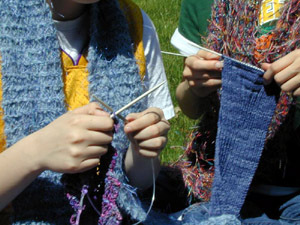 Yvonne Surrette expressed the significance of knitting for others so well in her essay Knitting Faith in the Future published in the Spring 2003 issue of Family Circle Easy Knitting:"When you knit for someone else, you are doing more than expressing your love. You are declaring a tremendous hope and optimism in the future. All of my own knitting over the years has been with expectation that my creations will be worn for years to come." Jordana is a junior at San Jose State University and recently started her own business, Jordana Paige. © 2003 Jordana McVey. Contact Jordana.